This topic contains 20 replies, has 11 voices, and was last updated by Jim White 5 years ago. Here’s an image of the Viper Racing UK SK250S installed in an Anderson Maverick 250 National chassis. Just a few jobs to finish, then we are ready to rock and roll!! Dang it Ian, you have really outdone yourself! The black power coated head will tick off the gas gas worshippers. If it performs as good as it appears (no doubt) a game changer as arrived! Very nice looking package Ian! Good thing Ian has a picture posted so we all know what Dan was referring to. I think. Does it have 6 gears and a counterbalance shaft? 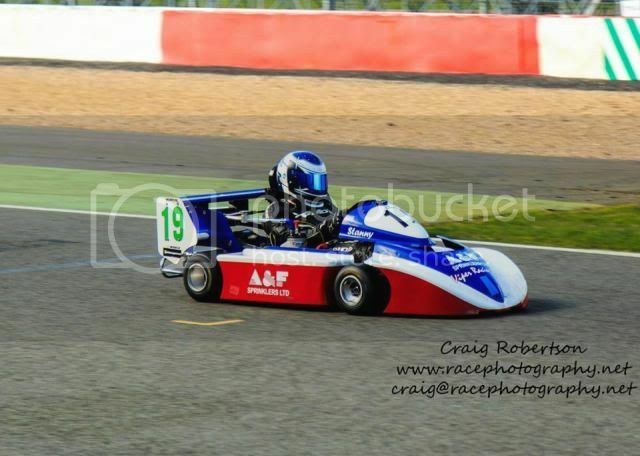 The Viper SK250S is a 250cc single cylinder Superkart engine. The cylinder is reversed (exhaust out-of-the-back) with a front mounted carburettor feeding into the crankcase via a reed induction system. The crankshaft is fully shrouded with just a slot through to the top end for the connecting rod. The crankcases are machined from billet aluminium. It has a gear driven counterbalance shaft with an internal balance weight on the right and an external balance weight on the left. The cylinder has 3 exhaust ports and 5 transfer ports. Gearbox, clutch and selector mechanism are taken from the 2002-2007 Honda CR250 and in standard (UK) format it is a 5-speed with alternative gearbox ratios. Our 6-speed gearbox can also be fitted if local regulations allow. The ignition is Viper Racing’s own digital programmable ignition that runs off the 2002-2007 Honda generator, however, many ignition options are possible. Very nice description of your…….”engine specs” Ian! Ian, I am inpressed and so glad I was not the only one who thought this should happen. With the intake being in the front you can get more of a ram air effect, a decent NACA duct on top of the side pods. A more compact package mean not only better aero, with the muffler tucked behind, but one could in theory put 2 smaller radiators in the side pods (a la F1 or Indy) and eliminate the large rear radiator and thus eliminate the “parachute” effect. Having existine Honda components is a big plus for ease of acceptability and familiarity, not to mention would be a big plus for the Honda spec peeps. I know its not polite to ask, but what are you looking at for cost per unit? I know feel I am one step closer to moving forward with this adventure! PS Just curious as to the steering wheel set up, could you show /explain more? Sorry Dan, That was to easy a setup. I couldn’t pass it up. brilliant product! Using/reusing existing Honda parts from your engine makes the most sense to me and it can save you about 1/3 of the cost.Why re-engineer and manufacture new components that are proven,already and easily accessible.Just change only what needs to be changed from the CR250 engine. Does it have an external water pump and how much does the engine and exhaust weight? Could anyone in north america purchasing one, post your opinions on it after trying it out? Vibration levels,smoothness,power and torque ect. First ever track outing for the Viper SK250S at Silverstone test day, with driver Mark Stansfield. Any more news from the second round of tests at Oulton Park? One thing I forgot to ask, would this be available as an conversion to an existing CR250 engine or is there too much internal modification required for this engine? We are actually expecting to get it on the dyno for the first time this week. That sounds absolutely crazy that we’ve been on track twice without it going on the dyno, but we were hit with availability on a specific part and then with some mods that we made. On both occasions finished the kart on the morning of the tests without time to dyno. Hopefully now, we have the time (6 weeks) to optimise and release the figures everyone is waiting for. However, we have learned an awful lot about the engine and the name of the game has been meeting peoples expectations regarding it’s appearing on track. Chris’ summary is pretty spot on and anyone is welcome to either buy the kit to build their Honda into, or to have us build it for them using their Honda parts or for us to supply a brand new fully ready to go package. Thanks for the favourable comments. As you might imagine we are now in the middle of the development programme to optimise carb/ignition/pipe design, etc. 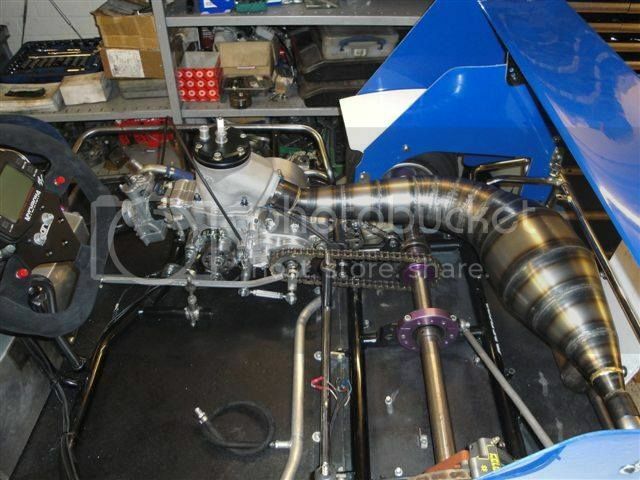 As a special introductory price, the complete engine package of engine/carb/pipe and ignition is £5,995.00 UK pounds fully assembled, dyno-tested and ready to go. The steering wheel is a Sparco car steering wheel and at present the buttons don’t do anything!! Just the wheel is the drivers personal choice . . . . nothing too exciting. I believe that the ram-airbox will end up under the right-hand pod, with probably a snorkel duct on top of the pod.